Alum, Turmeric and Sodium Metabisulfite added for Color Retention. From Redchile of Boene, Texas on 3/12/2019 . This is certainly a quality product but it has no heat at all. My taste buds like very hot and very vinegary flavor which this product is lacking both. If you prefer a mild slightly vinergery taste then you will enjoy. 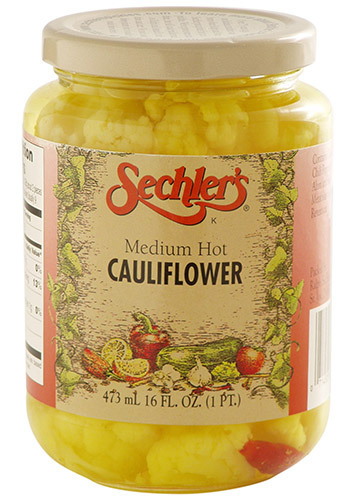 I cannot find the hot pickled cauliflower made about twenty years ago. I think the brand was Golden Gate. It was awesome! From Arthur Witherell of Rockville, Indiana on 9/15/2017 . Love the cauliflower. Great product. From Mike Helbert of Fresno, California on 7/25/2014 .